New York, MARCH 15 – Nearly one in two women journalists have experienced sexual harassment, psychological abuse, online trolling and other forms of gender-based violence (GBV) while working—yet “up to three-quarters of media workplaces have no reporting or support mechanism,” says broadcast journalist Mindy Ran, citing results of a survey survey released this month by the International Federation of Journalists (IFJ). Ran, IFJ Gender Council co-chair, overviewed the survey findings yesterday at the panel, “Challenging Impunity and GBV against Women Journalists and Media Workers,” one of dozens of parallel eventstaking place this week in conjunction with the 62nd session of the United Nations Commission on the Status of Women (CSW) in New York City. 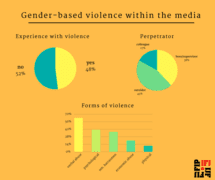 Without safe and structured systems for reporting gender-based violence at work, employees are less likely to seek assistance—and, as the survey found, 66 percent of journalists who had experienced some form of gender-based violence said they had made no formal complaint. “It is clear that the current approaches have had limited impact. We’re here to get practical,” says Ran, who opened the panel which included six experts in media and gender-based violence from around the world. Journalists, like other workers, also experience gender-based violence outside their workplace while doing their jobs. The IFJ survey of 400 women in 50 countries found that 38 percent of perpetrators were a boss or supervisor and 45 percent were people outside of the workplace (sources, politicians, readers or listeners). Thirty-nine percent were anonymous assailants, such as through cyber bullying. Mexico, one of the most dangerous countries in the world for journalists, has seen a “severe increase in violence against women journalists both online and offline,” says Aimée Vega Montiel, a research specialist in feminist communications at the Universidad Nacional Autónoma de México and vice-president of the International Association for Media and Communication Research (IAMCR). Yet there is a “cycle of impunity” and “media companies are not ensuring safety for women journalists,” she says. Zuliana Lainez Otero, president of the Latin American Federation of Journalists and IFJ executive council member, agrees. “Media owners, at least in Latin America, don’t offer protection,” says. Gender-based violence occurs around the world, and is one of the most prevalent human rights violations. Yet few laws address even some forms of gender-based violence at the workplace, and those are not enough or not enforced, further enabling employers to ignore the issue. Marieke Koning, International Trade Union Confederation (ITUC) policy advisor for gender equality, discussed how union activists, women’s rights champions and their allies can take action by joining the ITUC campaign for passage of an International Labor Organization (ILO) convention (standard) covering gender-based violence. Workers around the world could have access to a binding international standard covering gender-based violence at work after it is finalized. 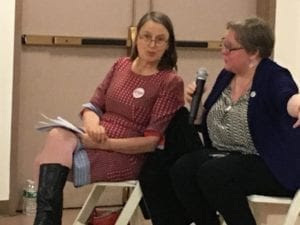 Domestic violence also impacts those at the workplace, and Vicky Smallman, director of Women’s and Human Rights, Canadian Labor Congress (CLC), shared details of a CLC survey of more than 8,000 union members that found 67 percent had experienced domestic violence. Of those, 47 percent say they were prevented from going to work by their abuser and eight percent lost their jobs because of ramifications from their abuse. Following the survey, the CLC went on help unions negotiate contracts with paid leave for workers experiencing domestic violence, and successfully lobbied two Canadian provinces to pass similar protections. Smallman credits the Australian union movement for taking the lead on the issue. Several panelists discussed how the lack of data on women’s experiences in the workplace, and the rates of specific forms of gender-based violence at work hamper efforts to define and address the issues. Carolyn Byerly, chair of the Howard University Department of Communication, Culture and Media Studies, described the lack of representation by women in the media documented in Global Report on the. Status of Women in the News Media. As principal investigator of the report, Byerly says the gender imbalances are still valid 10 years after the report was published. Byerly and others also warned that media consolidation is creating a global web of male structural power that further exacerbates inequities and inequalities in newsrooms and in media coverage. “The challenge we face is men’s control of media industries. The problem of media conglomerate is rampant around the world and is growing. We must put media ownership control on global feminist agenda,” she says.